FinalBuilder's Flow Control actions provide many of the control constructs you expect in a fully fledged programming language. You have Try/Catch/Finally actions to handle exceptions; If/Then and Switch/Case actions to conditionally execute child actions; and For and While loops to iterate over actions and Action Groups to structure a clean build project. Combined you can use these actions to create a FinalBuilder project as dynamic as your build process requires. 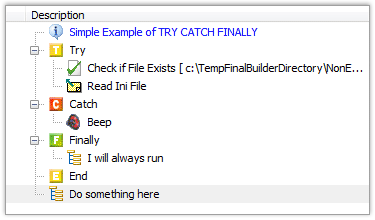 The Try/Catch/Finally actions can be used to structure exception handling. If child actions of a Try block fail, then the actions under the Catch block will be executed. This allows you to deal with errors that occur during the try block. These actions also need an End action to complete the block and they all need to be at the same node level in the tree to form a valid block. You can also nest the Try/Catch/Finally blocks, and they can be used in Try/Catch/Finally/End, Try/Catch/End or Try/Finally/End constructs. The Case action must be a child of the Switch action, the same goes for the Else. Note that the Else can also be used with the If..Then action. When used with the If..Then action the Else action must be the next sibling action of the If..Then action. Another conditional action is the If Previous Action Failed action. As the name suggests, this action only executes if it's previous sibling action has "Ignore Failure" enabled (otherwise the build would stop). 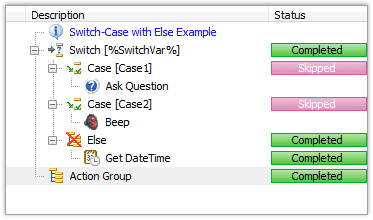 You can also use the Aysnc Action Group to multi-thread components of your build project. Run multiple actions in the build process simultaneously or entire build processes in parallel to improve the speed of the build. The image to the right shows a very simple implementation of the Aysnc Action Group executing 3 DOS commands simultaneously.